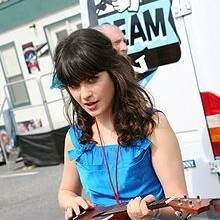 Zooey Deschanel is an American actress, musician, and singer-songwriter. In 1999, she made her film debut in Mumford, followed by her breakout role as young protagonist William Miller’s rebellious older sister Anita in Cameron Crowe’s 2000 semi-autobiographical film Almost Famous. She soon became known for her deadpan and “Manic Pixie Dream Girl” supporting roles in films such as The Good Girl (2002), Elf (2003), The Hitchhiker’s Guide to the Galaxy (2005), Failure to Launch (2006), Bridge to Terabithia (2007), The Happening (June 2008), Gigantic (September 2008), Yes Man (December 2008), and (500) Days of Summer (2009). She currently stars in the Fox series New Girl. She has been nominated for Golden Globe, Grammy, and Emmy Awards.